Planning to check out the restaurant scene on the Trail this month? You are going to have to do some searching. 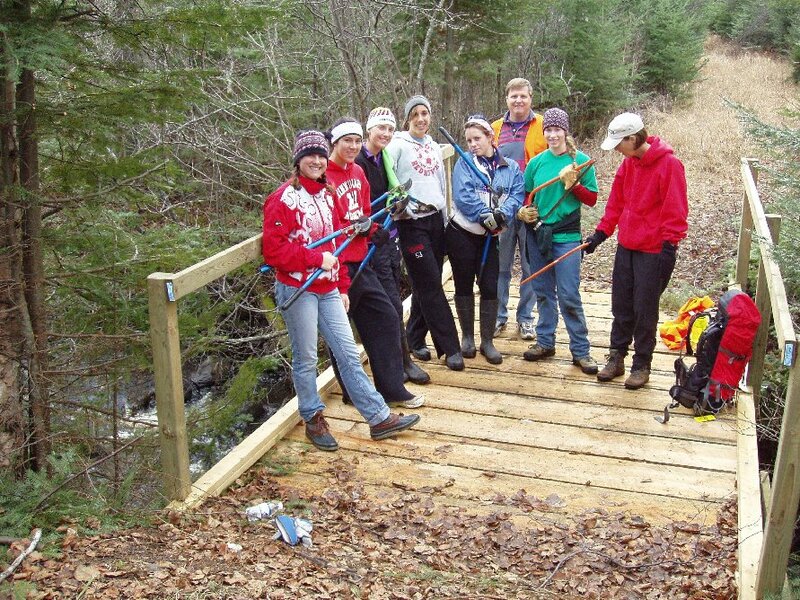 The Gunflint's "old stand-by" - Trail Center is closed until December 26. They normal close for cleaning during this period but this year besides the cleaning they are remodeling. The remodeling includes new siding, windows and expanding their kitchen. Gunflint Lodge's restaurant is open but plan to call (218-388-2294) for reservations. Old Northwoods is open occasionally, hamburgers fries etc. - call ahead (218-388-9464) as is Windigo, for bar food, (218-388-2222) and Hungry Jack lodges, pizza (218-388-2265). Trails End restaurant and Loon Lake Lodge's dining Room are closed for the winter. Thanksgiving, 2005- this morning the temperature dipped below zero, minus ten, for the first time this winter. Blustery-windy day with seven inches of snow on the ground. With the exception of the largest lake, the lakes are now ice covered. Poplar Lake froze-over on November 21. Guestshouse B&B now has five inches of snow on the ground. In the woods, you will find even more snow. While the ski trails are still not open it is anticipated that the eastern end of the Banadad should be ski-able by the end of the month. 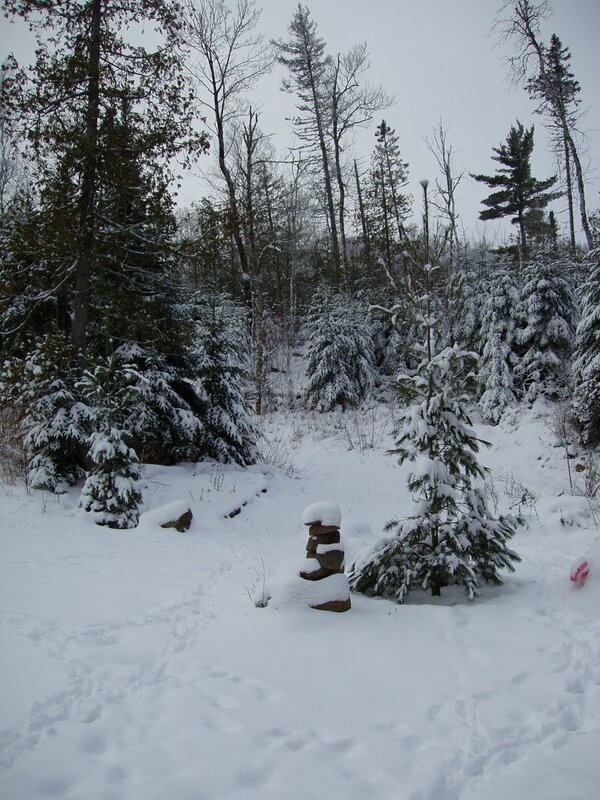 Meanwhile, guest staying at the Tall Pines Yurt figured there was enough snow on the ground to ado a little snowshoeing. They then took the two mile Lace Lake Trail from the yurt. The weather forecasts is calling for more snow over the next few days. The temperatures are expected to remain mild. Little Ollie Lake has iced over; Poplar Lake and the larger lakes are still open. Grand Marais, MN- With the Gunflint Trail receiving its first major snow of the winter- four to five inches now on the ground and more on the way, the Gunflint's cross country ski trail managers and lodges are busy getting ready for the opening of the 2006 cross country ski season. The Central Gunflint Ski Trail System operated by Golden Eagle and Bearskin Lodges have added a new ski trail. According to Dan Baumann, Golden Eagle Lodge, "Our new Ridge Run Trail should quickly become a favorite for all ages. It follows the southern ridges and features many vistas overlooking Flour Lake. The trail goes through birch, aspen, cedar and then to high country with virgin white and red pines." According to Baumann, "The trail will be groomed for classic and skate skiing." Baumann went on to state that Golden Eagle has modify several cabin, "in order to better accommodate asthmatics and people with certain allergies. We have replaced our wood stoves with smoke-free LP gas fireplace and we have also designated them as pet-free"
New along the Boundary Waters' (BWCA's) Banadad Ski Trail, operated by Boundary Country Trekking, skiers will find that a new eight-foot wide bridge has replaced the old-narrow Dawkins Creek Bridge. Skiers approaching the bridge down the hill from the west will no longer have to fear running into the old bridge's narrow side rails. Another enhancement along the Banadad that skiers will notice is the improved maintenance on the trail's remote wilderness interior. This fall crews from the Forest Service and North Star Ski Touring Club, armed with hand tools, cleared and widened three miles of the trail's most remote and difficult to maintain section. At the eastern end of the Banadad, skiers on Yurt to Yurt trips will be treated to the rustic luxury of the new twenty-foot diameter Tall Pine Yurt and sauna. According to Barbara Young, owner of the yurts and Poplar Creek Guesthouse B& B, "A recent yurt guest dubbed this new accommodation the Martha Stewart Yurt." Along the Upper Gunflint Trail Systems at Gunflint Lodge skiers will be greeted to several changes. Taking charge of the day-to-day operations at Gunflint Lodge will be the new management team of Lee and Eva Kerfoot. Lee and Eva are the 4th generation of Kerfoot hosts at the Lodge. According to Lee Kerfoot, "beginning December 1, Gunflint Lodge will open, an Adventure Concierge office. Guests that need a little know-how, or a tip to get them on the right trail, or recommendations on the activities they might be interested in, will now have a knowledgeable staff member here to answer their questions and get them pointed in the right direction." The Adventure Concierge office will be operated 7 days a week. Also at Gunflint Lodge two popular cabins are being remodeled. Upon completion these cabins will have a rock-wall fireplace, new Knotty Pine paneling, tile in the bathrooms and kitchens, the addition of a washer and dryer, complete new cabinets, and carpet. 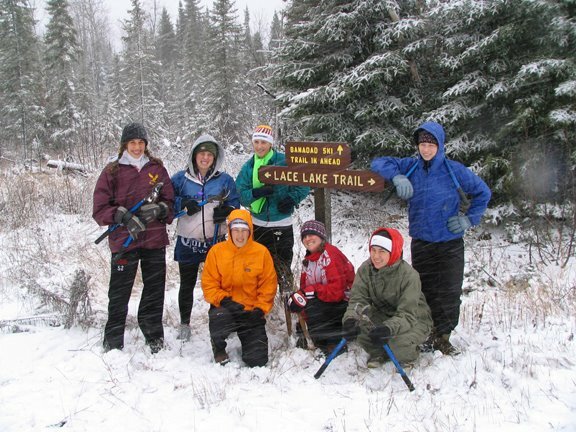 The one hundred and eighty-kilometer Gunflint Nordic Trails consist of three separate ski trail systems - the Central Gunflint and Upper Gunflint Trail Systems connected by the Banadad Trail System. For additional information on the Gunflint Trail cross country ski lodges and trails contact - Gunflint Trail information (www.gunflint-trail.com) or phone 800-338-6932. Sunday, November 13, the Gunflint was hit with its first major winter snow storm, when the blizzard conditions stop at the end of day five to six inches of new snow was on the ground. The new snow, however, did not stop the Minnehaha Academy's girl ski team from continuing the clearing of the brush from the Banadad. Six girl from the team, their coach and another parent spent the weekend working on the trail. Grand Marais, MN— The Gunflint Trail Association is pleased to announce the Second Annual Winter —Tracks Festival, taking place February 22 - 25, 2006 at a variety of Gunflint Trail locations. The annual event celebrates best that Minnesota winter has to offer — in classic Gunflint Trail tradition. Activities throughout the festival include cross country skiing, snowshoeing, snowmobiling, dogsled rides, races and contests, seminars, guided hikes and tours, a variety of unique dining options and discounts on equipment rental and at gift shops. The festival is open to the public and guests of Gunflint Trail resorts, and most of the activities are offered free of charge to registered Winter Tracks participants (registration for Winter Tracks is free). "This is classic winter fun at its finest," says Marti Marchino, Clearwater Lake resident and Winter Tracks coordinator. "There's something here for everyone. We realize that lots of folks need some how-to when it comes to the winter arts, so this year we're offering a variety of "intro to" events to get them started. All of us who live here love winter, and we want to share some of the fun and excitement with the rest of the world." Some of the specific events and activities planned include: ice fishing seminar, snowshoe and cross-country ski lessons, guided snowshoe trek and tipi campfire, Mongolian Firepot Dinner, snow sculpture contest, snowmobile poker run, wildlife seminars, XC ski races, snowshoe obstacle course, broomball, dog sled rides, winter camping seminar, intro to snowmobiling, lit trails for night skiing, special activities for kids, ice skating, sledding and free ski trail passes. One special event will be the awards banquet featuring an outdoor winter picnic. The resorts and outfitters of the Gunflint Trail offer a variety of lodging options, plus dining, shopping and friendly hospitality. Visit- http://www.gunflint-trail.com/ to explore the options. A complete listing and calendar of events can be found on the Winter Tracks web site at http://www.wintertracks.com/. Gunflint Trail residents Bob Marchino and Charlie Helbling took what Marshio called, "the canoe trip of my life." This summer the pair paddle two hundred and fifty miles from Rainy Lake to Lake Superior along the historic "voyageur highway." To read more about their adventure click on an article written by Helbling which appeared in the October 23, 2005 addition of the St. Louis Post Dispatch. Marchino, along with his wife Marti who together formerly owned Clearwater Lodge and Outfitters now live year-around across from the lodge on Clearwater Lake. Helbling and his wife Becky have a seasonal cabin on West Bearskin Lake. Second morning in a row with fresh snow. Yesterday at Little Ollie Lake two inches of new snow fell during the night. This morning another inch fell. Yesterday afternoon's above freezing temperatures took most of yesterday's snow. With this morning snow only about an inch is now on the ground. The temperature is hovering at about 30 degrees and the forecast is for above freezing again today. With deer hunting season opening this morning the fresh snow should aid the hunters tracking their prey. What is is good for the hunters is not great for others. Today a trail crew is planning to clear brush along the Banadad Ski Trail. The snow will make for a wet day of brushing for trail crew.